ALL STAR REAL ESTATE – located in Bay City, Matagorda County and Sweeny, Brazoria County, TX. We opened for business in January 1996. Are you looking to buy, sell, or rent? Our community is experiencing growth in many ways and we are here to service your real estate needs: sales (buyer and seller agents), rentals, and property management. We are proud to be members of the Bay City Chamber of Commerce & Agriculture, Brazoria and Matagorda County's Board of REALTORS and Multiple Listing Services, Texas Association of REALTORS, and National Association of REALTORS. The owner is a registered HUD Broker, so we can sell HUD owned properties throughout Texas. Highway 35) in Bay City, corner of Seventh Street and Peach, directly across from Dairy Queen. 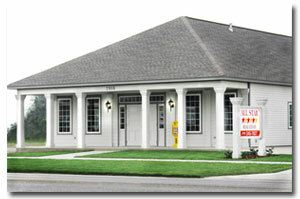 Our unique building was constructed in 2007, patterned after a home built in 1834. Our branch office opened in 2009 at 216 N Main in Sweeny, corner of N Main and Third Street and next door to Royal Cleaners. The main phone number is (979) 548-7827, fax is (979) 548-7875. This website was created with you in mind. We are just an email, fax, or phone call away to answer your questions and schedule a meeting with you. Thank you for your visit.